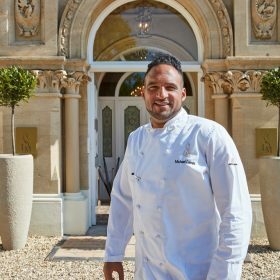 Michael Caines MBE, chef/patron of Lympstone Manor, is one of Britain’s most celebrated and acclaimed chefs, and and has held two Michelin stars for 18 years. Over the past 21 years he has earned a global reputation for his distinctive modern European cuisine utilising the finest local and regional ingredients. Amongst numerous other accolades, Michael has cooked in 10 Downing Street for the Prime Minister, received an MBE in 2006 for services to the hospitality industry and was awarded AA Chef’s Chef of the Year in 2007. Michael appears regularly on television on programs such as BBC 1 Saturday Kitchen, Masterchef, Sunday Brunch, The Great British Menu, and The Great British Bakeoff Extra Slice. In addition to Lympstone Manor, Michael oversees Michael Caines restaurants in North Devon (The Coach House by Michael Caines at Kentisbury Grange) and North Wales (Palé Hall). He is also a partner and ambassador for Williams Formula 1 Motor Racing team, overseeing the catering at Grand Prix throughout the world. In 2016, Michael was granted Freeman of the City of Exeter in recognition of his services to the city of Exeter and the wider community. To encourage the next generation of young people in the hospitality industry, he created the Michael Caines Academy at Exeter College. He is the driving force behind the Exeter Festival of South West Food and Drink. The Michael Caines Foundation, meanwhile, supports a number of charities including Families for Children, Farms for City Children, the Exeter Foundation, One for the Boys, WESC and Devon Wildlife Trust.